Post here your questions and comments about the Creating Ceilings tutorial. Well done! I've been waiting on this one for a while now. I was using my own version, but it wasn't as elegant with the automatic light spacing. Is there a way to export that light spacing setting so we can control it from the modify panel? Thanks for the kind words, I'm glad you find the tutorial useful. Regarding your question, because the counters are generated dynamically when segments are added, I'm afraid there is not currently a way to export them. However this feature has been requested before and we're looking into it. Thanks to you.Very useful tutorial for me. How would you go about ensuring that you have a frame all the way around the perimeter of the ceiling tile? Those ACT tiles don't just die into the wall, they have a frame on the edge. Can it be done in rail clone or would it be easier to simply sweep the outside frame and rail clone only the inside parts? Additionally, is there a way to make sure that all of the outer edge tiles are ACT tiles and not lights regardless of the sequence? At the end of the tutorial, you can see half of a light just ending into randomness. Thanks for the questions. To add a frame around the edge you can add a second L1S generator and use the same boundary spline, then add a segment with the frame profile to the default input. You may wish to adjust the Y and Z Offset to control the position of the frame. Removing lights on the border is trickier to achieve, there is not currently a way to test to see if a segment is the last in a row or column or has been sliced. An alternative, which will work for rectilinear rooms, might be to use conditional operators and test for a minimum and maximum segment count on each axis. In this way you can This sequence of 4 conditional operators lets you control the point at which you want the lights to start and end. I've attached the file for you to take a look at. I hope that helps, please let me know if you have further questions. Thank you very much for this tutorial. Very useful. I will certainly use this for future projects. 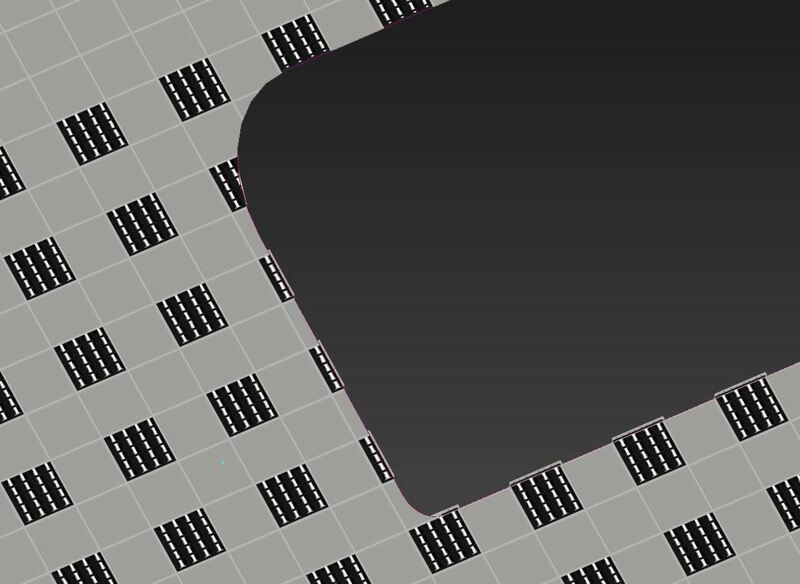 The only issue I have is how can I avoid lights being cut on the edges if I'm using an irregular shape? Is there any rule I can create in order that all the lights on the edges are substituted to the ceiling object? Select the Railclone object and change the clipping spline to the inner perimeter. You'll now have only whole lights but space around the edge. I Hope that helps, please see the attached file for this example. Thank you very much for your explanation and thank's for your quick reply! My question is regarding creating the 2x2 grid but using 2x4 lights. I have attached a screen shot of the rail clone screen along with what is being created. Any help would be appreciated. Keep up the good work. Thanks. The easiest way to avoid similar issues is to have Segments of the same size - as rows are always the full height of the tallest segment and therefore building the style from Segments with equal Y Size is much easier (as on the first attached screen-shot). In you case, rotation the RailClone object (to switch X & Y) might be a solution. When this is not possible, it requires combination of Sequence Operators to archive it. I would suggest you to check the "Cobblestone pattern" thread, where you can find a possible solution for these cases. Attaching a sample scene with style from such thread that uses shown "YYX Sequence" work-flow with several Arithmetic Operators performing automatic calculations of sizes & counters. Hope you'll find it helpful. I am very new to RailClone, but already loving it! I am following this ceiling tutorial to create my own version and got 2 questions. 1. Can I "offset" the sequence? I have made a pattern of 2 panels then 1 light unit. I simply want to offset the sequence so it starts 1 panel, 1 light, 2 panels, 1 light, and then 2 panels and continue from the edge of my boundary. I know I can make it by plugging 1 panel, 1 light, 1 panel into a sequence, but it would be nice if I can simply offset the sequence. Ideally I want to export number of the panels so I can easily adjust the count of plain panels between the light units for flexibility. 2. Would it be possible to some how link vray light to light unit? It would be nice if I can automate the process of instancing vray light under each light unit. Thanks for your kind words about our plug-in. "I simply want to offset the sequence so it starts 1 panel, 1 light, 2 panels, 1 light, and then 2 panels and continue from the edge of my boundary." An option would be to make a copy of the Sequence Operator, adjust counters accordingly and use the Conditional Operator with the Segment X Counter - Equal to 1 to use that one just on the beginning. Attaching screen-shots. "Would it be possible to some how link vray light to light unit? It would be nice if I can automate the process of instancing vray light under each light unit." I would suggest you to check this tightly related post. Hope that helps. Thanks for quick response. I followed your steps and managed to offset along x. By exporting Conditional Operator's Segment X Counter, I also managed to change the number of panels to offset. Now I want to have off set along Y as well. When I input result of Conditional operator into another Conditional to offset along Y, I run into trouble. The way I set up, it always add extra panel at the start of Y axis and not sure how to solve it. Can you kindly have a look and suggest the way to achieve what I trying to do?